Creating a DIY starburst mirror is an easy way to transform a cheap small round mirror into something more dramatic. Using wooden dowels, spray paint, hot glue and a round mirror you can create the look of a high-end mirror that works well with most decorating styles and is an excellent way to fill an empty wall. Remove any stickers or labels on the wooden dowels or mirror. Using your ruler and shears cut 8 dowels to be 15 inches long. Evenly space the dowels around the back of the mirror so that the ends of the dowels touch in the middle. Using the glue gun glue the back of the mirror to the dowels. Next cut 8 dowels to be 8 inches long and place these dowels between the longer dowels. Glue these dowels to the back of the mirror. Continue filling the back of the mirror with more wooden dowels cut either 10 inches or 12 inches long and evenly place them around the back of the mirror. Glue these medium length dowels in place. The number of dowels required will depend on the size of the mirror you use, so use your own judgment when there are enough dowels. Allow the glue to fully dry, which should take a few minutes. Flip the mirror over and cover the mirrored section of the mirror with painter's tape to protect it from getting covered in paint. Make sure to carefully tape the whole mirror. Take the mirror outdoors or in a well-ventilated area and place it on a drop cloth. Apply two to three coats of spray paint until there is an even finish. When applying the spray paint use light coats of paint and allow the paint to dry between coats to prevent drip marks. Remove the painter's tape from the mirror once the paint has fully dried. After the mirror has dried attach a wire, or a hook designed to hanging artwork to the back of the mirror. 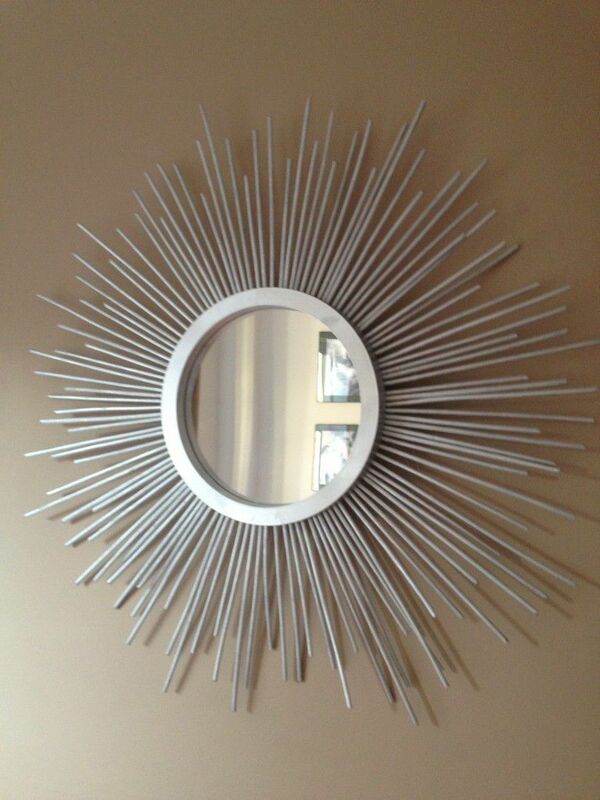 Hang the starburst mirror as you would normally hang artwork on your walls. A cheap alternative way to hang the mirror is to glue the pull tab from a canned drink and to glue the tab onto the mirror as a hook. For an extra dramatic finish, you can add tiny circle mirrors to the end of the wooden dowels using hot glue to attach the mirror pieces. If any paint got onto the mirror it is possible to carefully scratch off the paint using a craft knife. DIY Blogger Spotlight: This glam starburst mirror was created from Sammi from Every Home Is A Castle, a DIY blog written by Sammi and her husband Simon.